Have you ever heard the saying, “Organization is the key to success”? Well when it comes to your Oahu Wedding, it is most definitely true! It is very important to stay organized from the very beginning of starting to plan your wedding day. There are so many details that have to go in to planning a wedding, and being organized can prevent you from getting overly stressed. Here at Best Day Ever Hawaii we have a few tips on how to stay organized for your Hawaii Wedding. Once you determine your wedding date, set specific dates by which you want to get things accomplished. For example, you got engaged in June, and your wedding date is April 24. On August 31, mark in that you want to have the ceremony location and reception hall reserved. Try to get as much done as possible in the first few months so that the last few months won’t be so hectic. Choose a day of the week when you’ll focus on the wedding details, or several days. Sit down together and plan. This eliminates confusion – i.e., the groom thinks he’s supposed to call and check on hall rentals when the bride has already narrowed it down to what will suit their needs. This is the best way to get things done. You should both be involved in every step along the way. Make a list of details to be taken care of, then divide the list in half. Each of you choose what you want to do. This will help to make the grooms want to be involved, instead of making them feel like they have to help. Involving your husband to be will make him feel that it’s his wedding too. 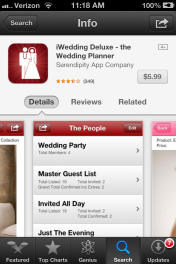 If you are a bride on the go, you need an app called Bride Guide. It helps you keep all of your precious wedding information in the palm of your hand. It was designed by a wedding planner, so besides checklists, budget trackers, and calendars, you’ll also get helpful articles and real-life wedding advice, like which flowers are in season. If you don’t want to carry a binder to keep track of everything, every where you go, I highly recommend this app! Don’t be afraid to ask for help from family members and friends! You don’t want to take on too much and become stressed out months before your wedding. Talk to your friends and see what they would be willing to help out with, that’s what they are there for! There’s a lot to think about when it comes to planning a wedding, that’s why it is so important to stay organized from the very beginning! Hope you enjoy our Top 6 Wedding Tips and I hope they help you stay organized throughout the whole process! To all our favorite Hawaii Brides and Grooms ~ Congrats on your engagement! Hawaii Couple Pic courtesy of one of our featured photographers: Ashley Goodwin.